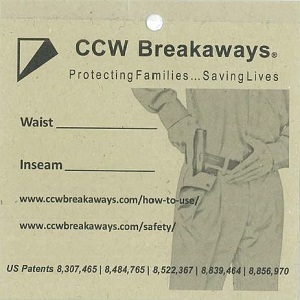 CCW Breakaways promotes Safety First . . . Safety Always! Practice safety and be responsibile with your firearms and our products. First, if you are ever in doubt about a practice, a procedure, an operation or the selection of a firearm or any firearm-related equipment-gear-clothing, seek professional and certified instruction. The NRA is one place to find competent instructors. This link will help you begin your journey. Second, always obey the universally taught and industry accepted Gun Safety Rules. If you obey these rules, you will never have an accident. Download either the NRA or the NSSF brochures by clicking on the links provided here. Third, use firearms with manual safeties or implement and use an after-market safety device. We promote and sell SAF-T-BLOK as one solution that can be used with Glock firearms. There are other options available on the market. Seek, discover, and implement the best solution to meets your requirements. Please also examine Glock's Safety Pledge | #FollowTheFour or click on the image below. Proper gun handling skills must be practiced in order to develop proficiency. Please practice regularly! A great place to begin proper handling skills can be found on the linked image below. It is essential to understand the effects and consequences of improper handling. Negligent or accidental discharges (a.k.a. ND's and AD's) can result from poor trigger finger discipline. Please seek competent instruction when in doubt. 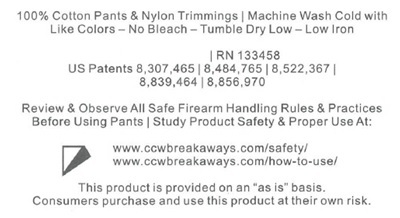 Inside each pair of CCW Breakaways Pants you will find our product care tag sewn into the back pocket. The product label provides instruction for washing and care of your products but it also promotes our Safety First - Safety Always! webpage.